As HIV rates have stabilized, HIV-positive individuals are living longer lives. More and more people today are in relationships where only one of the two people has HIV (an HIV-serodiscordant relationship). While there has been research on living with HIV, far less is known about the issues faced by HIV-serodiscordant couples. Researchers from the Dalla Lana School of Public Health, in collaboration with physicians and AIDS Service organizations from across the country, are therefore undertaking a national study of people in serodiscordant relationships. This study, named Positive Plus One, is unique, because we want to hear from both the HIV-positive and HIV-negative partner in a serodiscordant relationship. Each partner will complete the survey on their own, and not in the presence of each other. However, if only one of the two partners wants to participate, they can also be involved. If a person has recently (in the last 2 years) been in a serodiscordant relationship, they can also participate, but we will not ask them to invite their partner. Positive Plus One is a mixed-methods study, meaning it includes both a survey, and an in-depth interview. Anyone who takes the survey can also volunteer for the interview. From the survey, we will obtain a broad understanding of serodiscordant couples’ relationships, as well as the characteristics of serodiscordant couples across Canada. From the interview, we will learn about how these relationships unfolded over time, and provide people with the opportunity to share their experience of living in a serodiscordant relationship. Participants will receive a $20 gift card for participation in the survey, and an additional $40 gift card if they are selected for the qualitative interview. 5) If they are HIV-positive, they have disclosed their status to their HIV-negative partner. To learn more, and to take the survey, visit our website at www.PositivePlusOne.ca, or call us at 1-888-740-1166. The Vancouver Infectious Diseases Centre (VIDC) and the Empire of the Peace Arch Monarchist Association (Imperial Sovereign Court of Surrey) together with Lookout Emergency Aid Society (formerly KEYS Housing & Health Solutions) invite you to the 8th Annual Red Ribbons For Life (RR4L). This event was founded in 2008 by Martin Rooney as a part of the campaign to remove the US HIV Travel Ban. Proceeds have surpassed $35,000 since its inception and have benefitted two worthy organizations — primarily the Surrey HIV Food Bank (operated by Lookout) and AIDS Tijuana (Traux House), a clinic in Tijuana Mexico operating with funds raised through the International Court System and the Imperial Court de San Diego California. 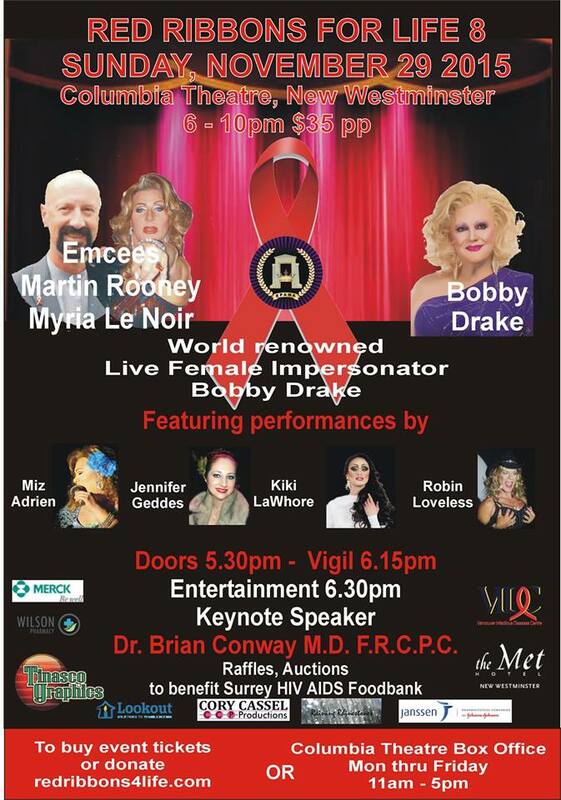 Red Ribbons 4 Life has now become the largest single, one-night benefit for AIDS in the lower mainland outside the city of Vancouver! It will definitely be a night to remember with breath-taking performances, an informative keynote address, an AIDS Memorial ceremony, silent and live auctions, and raffle draws — all while raising funds and awareness for the on-going battle with HIV! (PC: Emma Briones) Dr. Brian Conway MD FRCPC is following-up on his popular addresses at the last two years’ events this year for RR4L 8! VIDC’s President and Medical Director, Dr. Brian Conway, will be giving the keynote address at the event. World renowned Live Female Impersonator, Bobby Drake, is the headline performer for the celebration. A number of amazing local talent — Miz Adrien, Jennifer Geddes, Kiki LaWhore, Robin Loveless, and more — will also be gracing the stage with their performances! We invite you to join us in making this event successful! Tickets can be purchased from the website. Last week VIDC had the opportunity to get involved with two momentous community-focused events by S.U.C.C.E.S.S. and RésoSanté Colombie-Britannique. On September 20, 2015 VIDC partnered with S.U.C.C.E.S.S. and had a Community Pop-Up Clinic (CPC) set up at their annual health fair. 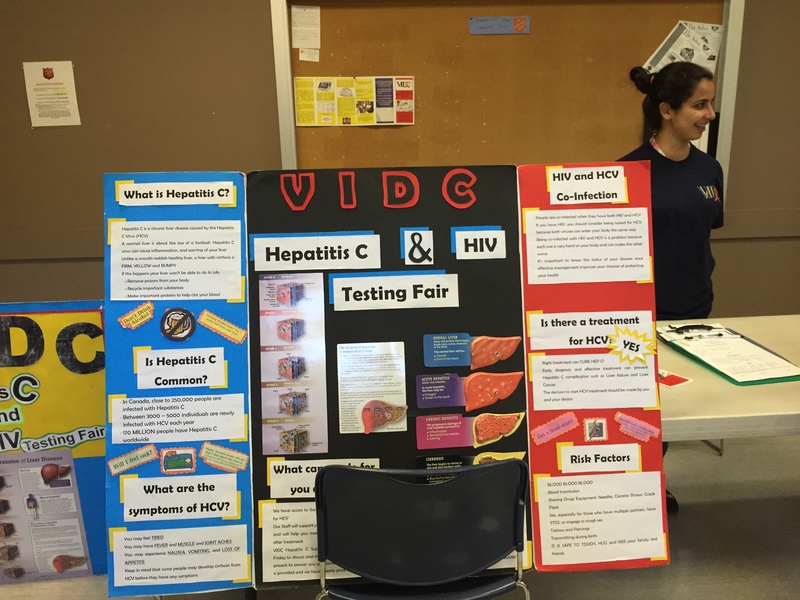 At the fair, we tested over 100 people for hepatitis C. And even provided FibroScan® options for those who tested positive, or who self-report being previously diagnosed with hepatitis B. We provided services in Mandarin, Cantonese, and English to ensure that information is being delivered efficiently. On September 22, 2015 RésoSanté launched their directory of health care professionals that can provide services in French. This year was a momentous event for them as their directory now has 1000 health care professionals in BC that cater to the Francophone community — and of course, VIDC is on the list! 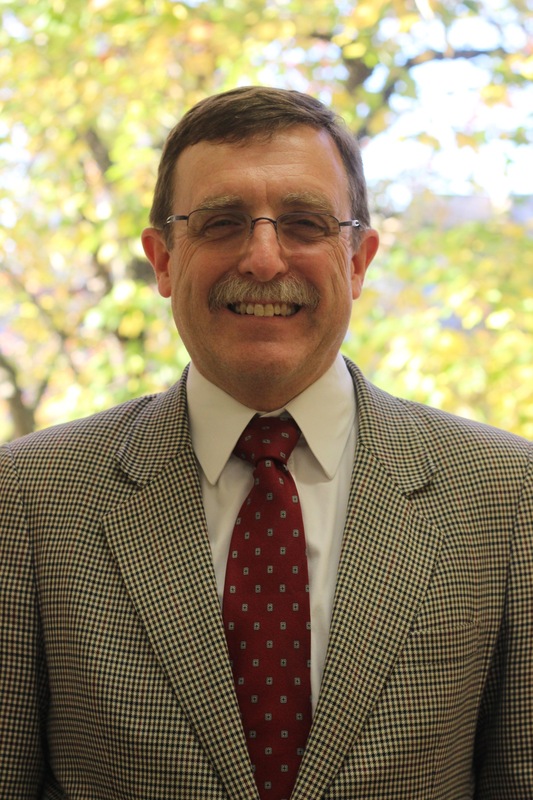 (If you don’t know, our President and Medical Director, Dr. Brian Conway, is a Francophone!) At the launch, Dr. Brian Conway was invited to speak on the importance of receiving health care in your own language. VIDC’s involvement in these events are the first steps we are taking into pursuing our commitment to providing a community-based holistic approach to treatment. Dr. Conway’s statement rings true regardless of what language or culture is in question — health is one of the few fundamental things that one should have access to, and this access should be facilitated through the right medium. Click on the photo to listen to the broadcast. Stephen Quinn’s interview with Dr. Conway starts on 1:40:20. Last Thursday (September 10) our President and Medical Director, Dr. Brian Conway, was on the CBC Radio show On The Coast as the Hepatitis C Expert. The interview was a response to the recently published study from UBC with shocking results concerning Vancouver’s Downtown Eastside (DTES) residents. UBC News article on the study. According to the study, DTES residents are dying at a much higher rate compared to the national average, and not due to HIV/AIDS or substance overdose. Dr. Conway came on the show to speak on these findings — findings that, as VIDC’s President and Medical Director, does not surprise him. These results, as he mentions on the interview, parallels what we see when on our regular visits to the DTES for our Community Pop-Up Clinics (CPCs). The surprise that came with the results confirm one more important reality: there still isn’t enough awareness about hepatitis C.
According to Dr. Conway, the prevalence of HCV in the DTES community is because of a number of things. However, the main factors are: prevalence of injection-drug use, lack of awareness and education about the cure available for HCV, and the social situation of the residents. Not only is a very vulnerable population not aware of the disease and its cure, most of them have difficulty even accessing basic health care. It also does not help that HCV is asymptomatic (does not show symptoms) until about 20-25 years after infection. We have Community Pop-Up Clinics at various locations in the DTES to provide point-of-care testing for HIV and HCV. This is one of main driving forces behind VIDC’s CPCs and the health-care model that we have at VIDC. By heading out into the community, we promote awareness and education while making health care a lot more accessible to the community members. Also, at VIDC, we understand that often treatment for a disease that is asymptomatic is the last thing on their minds. Why would they seek treatment when they are worried about where they can spend the weekend and how they will eat for the next couple of weeks? This is why our patient care takes all these into considerations. Often our nurses, research coordinators, clinic staff, and physicians would help patients with their housing application, or contact shelters and soup kitchens for them — all these on top of getting them started on treatment, applying for treatment fundings, and providing general health care.